This post is about ukestra, community music, Mark Jackson and Jane Jelbart. And The Sum of the Parts. If any of these terms are strange to you, read on! Jane and Mark are community musicians, based in Newcastle, Australia. They’re also musical entrepreneurs and social activists. They have developed a lively, hugely popular ukulele group music making genre called ukestra. And their community music business is called The Sum of the Parts. I’m so glad I went. It was fun and inspiring. It was much more than a concert. It was an introduction to ukestra. Which as its name suggests, is a ukulele orchestra. This year Mark and Jane published two books: The Business of being a Community Musician and The Ukestration Manual. These books are a fascinating glimpse into their work. Actually it’s a lot more than a glimpse. They talk about their business with a level of detail and candour that is rare in the musical world. Community musicians Jane Jelbart and Mark Jackson. Photo from their website. I was delighted to find that Jane and Mark have a big picture concept of what they do, why and how. They are building community through music making. Musicians after my own heart! And like me, they’ve found that the ukulele is the quickest and easiest way into that. They also work with choirs. Their big picture includes reintroducing music making to everyday life, and reviving people’s ability to express themselves through music. And, they say that community music should be sustainable both economically and personally. Also like me, they’re not from school music teaching backgrounds. Mark has been playing in pub bands since the late 1970s, and has also worked in mental health services. Jane was a marine biologist until the business started making enough money for her to leave her day job six years ago. Ukestra is a group music making form. 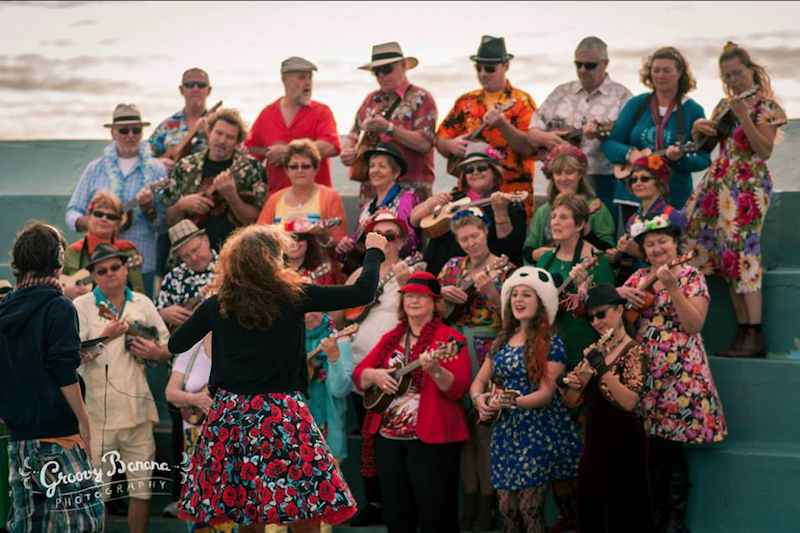 It’s also about teaching ukulele and other musical skills in a social environment. As the name suggests, the musicians play parts. Some parts are easier than others. Everyone can contribute at different levels. More skilled musicians can be challenged by playing the more complicated parts. 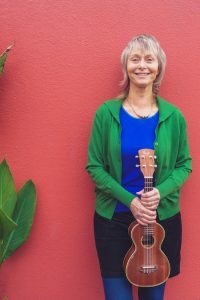 This produces an overall sound, that’s much more systematically organised than the Uke Jam format that I work in, where people play what they can and what they feel like playing (as long as we’re all playing the same chords and rhythm). Ukestra works really effectively in performance. Ukestra sounds simple, but it’s actually quite musically complex. It needs skilled leadership and organised parts. The Ukestration Manual has lots of useful detail. However, as with most musical learning, you can’t teach it from books. There’s no substitute for experience. I’d strongly suggest that you find your way to one of Jane and Mark’s workshops to learn more. I’m keen to experience more ukestras before I try my hand at leading one. Mark and Jane talk about the business side of being a community musician in detail that I’ve never seen anywhere else. The purpose is important, but so is the profit, they say. In The Business of Being a Community Musician, they’re up-front about their business model. They show us the books! This isn’t a hand to mouth, under the table enterprise. It’s a well thought out, innovative, successful six figure business. Average annual turnover was $160,000 AUD between 2013 and 2016. That translates to income of $AUD33,000 for each of them. Which is modest, but it’s sustainable, they say. The business includes national and international travel. And it provides employment for other people, including administration help, another ukestra leader and assistant teachers. 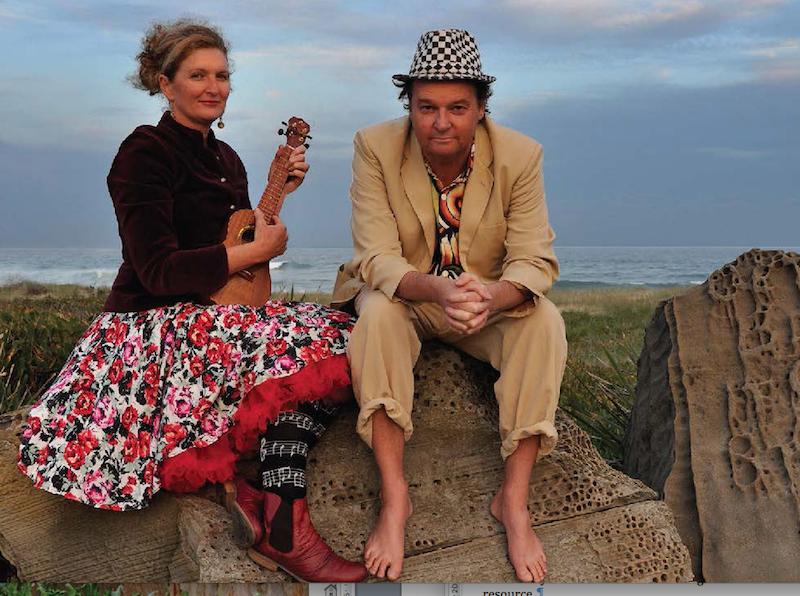 Jane and Mark say there are good reasons for community musicians to make a sustainable income. This is valuable work and needs to be rewarded, they say. Although they acknowledge that some community music leaders may have other income that means they don’t need to make money from their music activities. However, “organisers who are not paid have significantly fewer reasons to stay the course when facing challenges,” they say. They run eight weekly ukestras and two choirs. Other income streams include book sales, recreational music in hospitals, performing income, one-off workshops. They say that multiple income streams are needed for a sustainable community music business. An innovative aspect of the business is the Uketen prepay system. People don’t pay by the term – they just pay for the ukestras they attend. They pre-purchase ten-sessions. The payment system is handled by special CRM software. Ukestra fees are equivalent to two hours of entertainment, i.e. a movie ticket, or two beers and a pack of crisps, or two coffees and a cake. Central to The Sum of the Parts social and economic model is that ukestra venues cost nothing. They’re generally held in social clubs, that are under-utilised and value the new patronage. Lawn bowling clubs are particularly good venues, Mark and Jane say. Ukestras also take place in bars and cafes. These books are both inspirational and practical. They are a fascinating glimpse into the inner workings of a community music business. 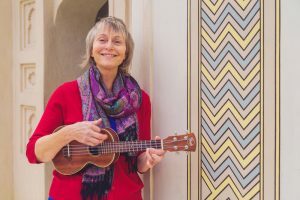 Anyone working in community music and ukulele teaching will find them interesting and useful. The Sum of the Parts on Facebook. A Youtube video of Ukastle Ukestra in performance. A video of Mark and Jane talking about what they do.